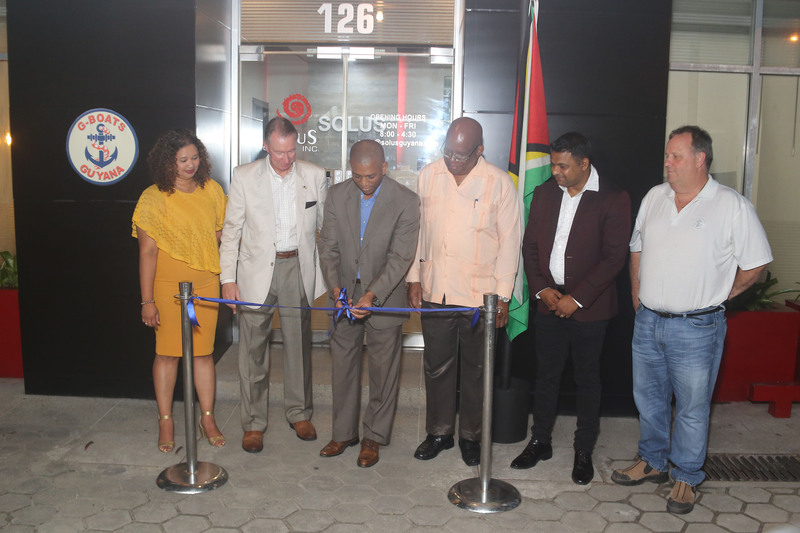 The doors of oil services company G-Boats’ local office were officially opened last evening with a heavy emphasis on supporting local content through the employment of Guyanese. G-Boats, now located at Lot 126 Quamina and Carmichael streets, Georgetown, is a subsidiary of Edison Chouest Offshore, a global company that provides supply vessels to Oil & Gas operators around the world, including ExxonMobil. Speaking at the commissioning ceremony last evening, Edison Chouest Offshore Business Development Manager Daniel LaFont said that the company started 58 years ago with just two boats and has since expanded to 300 boats and over 10,000 employees around the world. Included in this list are neighbours Trinidad and Brazil, both of whom are said to have 70% and more local personnel working for the company in their respective countries. LaFont explained that Edison Chouest Offshore came to Guyana in January, 2016, with just three vessels and has since moved to having 10, with an estimated 68 Guyanese being employed in the process. Meanwhile, Dr. Mark Bynoe, Head of the Department of Energy, spoke at the launch and he aid partnerships such as the one shared by Guyana and Edison Chouest Offshore demonstrate the positive strides that the country is making as a place for doing business and increasing the number of investors in the country. He noted too that while “first oil” is projected in the first quarter of 2020, the sector is already showing “green shoots” in the form of shore bases being constructed, capacity building and job creation, among others indicators. “From the equal venture here in Guyana alone, we have seen 67 Guyanese already being employed and another four soon to be employed; it is easy to smirk at these numbers but to one of the 42 oil service riggers, this venture means a secure livelihood or for one of the five oilers, an improvement in their quality of life. Moreover, their skills are being built, making them significantly marketable than when they commenced working. Guyana is on the precipice of takeoff and we are happy to be a part of this journey and to be setting the pillars for the transformation that is to come,” Dr. Bynoe said. “The successful development of the oil and gas sector is vital for this transformation, in terms of its catalytic impact and raising of the standards necessary for increased competitiveness of firms and industries. The change occurring does not only expect to add jobs through shore base operations, engineering and fabrications, but also based on the development projects that will be pursued with the oil revenues,” he added. Notwithstanding, Dr Bynoe said that the challenge for the nation remains being able to create sustainable jobs for the citizenry, producing outcomes of the education systems that fit the job market and growing local content in investment decisions. “It is patently clear that skills to be developed both for the oil and gas sector and the development projected from the revenue generated therefrom must be targeted, strategically deployed and nurtured. We within the Department also seek to encourage greater joint venture partnerships since apart from increasing local content, it also has the added advantage of providing the opportunity for local business to gain new, insights and expertise as well as Guyanese businesses (gaining) access to better resources such as specialized staff and technologies,” he further posited. Meanwhile, President of the Georgetown Chamber of Commerce and Industry Deodat Indar commended the company on its local content. “I believe that the number is 50% plus in terms of the ratio of Guyanese to foreign workers and that is testament to the spirit of local content and job provision. This footprint here signals intent and that intent is something that is not just written on the walls of Edison Chouest Offshore… They have their policies on the wall but they actually live it and that is a testament to how that company operates,” he added.